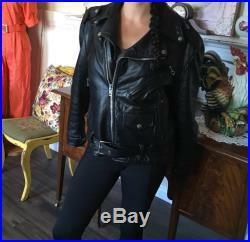 Authentic vintage black leather motorcycle biker jacket, warmest best leather jacket, circa 1980 very cool lots of thick chunky toothed zippers, 2 zip up slightly angled in side pockets, on the left front above the waist belt is a nice size envelope pocket with snap close, chest zip up pocket dramatically angled out, the sleeve zip down 7" ending 1" from wrist. 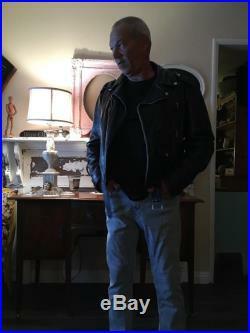 The jackets' zip front runs from center bottom at a slight angle up and to the right a wide lapel that sits at upper chest in a "v" formation with snaps on either side when unsnapped it can be zipped to the neck then the collar lapels will cross over each other and hold a scarf or neck cozy quite well. 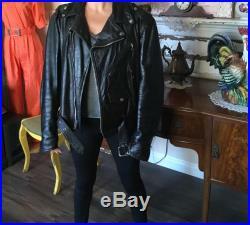 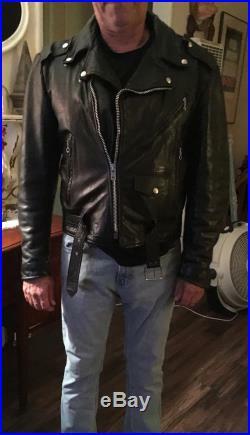 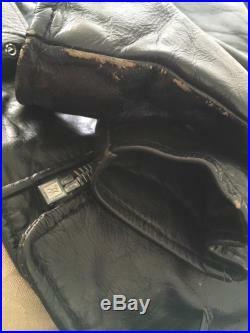 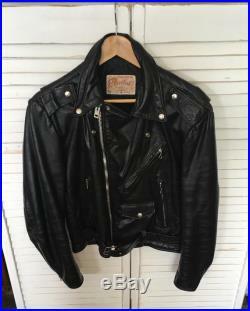 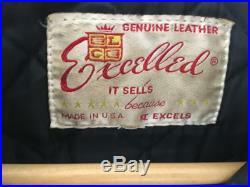 1980s black leather jacketsize mens size small jacket size tag has gone missing, please read measurements stated below for accuracy of fit. 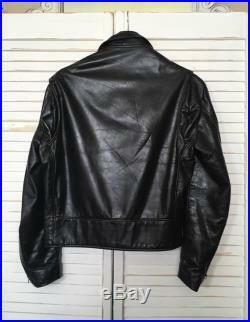 Made in usafabric leather exterior, quilted lining 100% nylon faced, surrounding fiber that is 50% acrylic and 50% other. 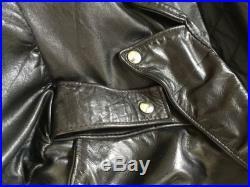 Color black shoulder seam to seam 20" shoulders are sporting iconic large snap close epaulets arms from shoulder seam 25"arm inseam 17wrist when zipped approx.